CARFAX 1-Owner, Jeep Certified, GREAT MILES 18,772! 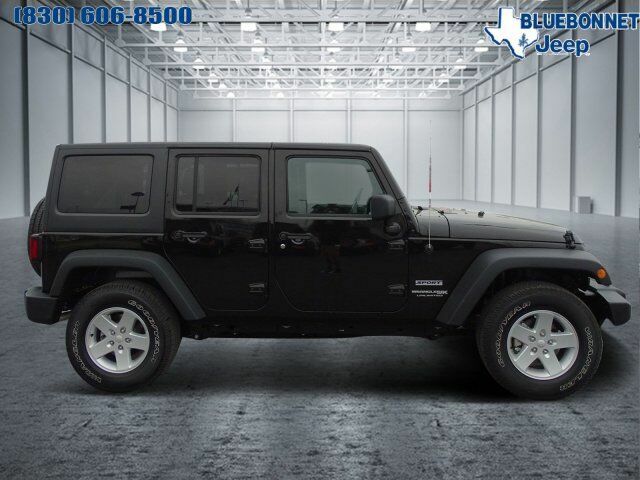 Alloy Wheels, SIRIUS SATELLITE RADIO, RADIO: 430, Brake Actuated Limited Slip Differential, CD Player, 4x4, TRANSMISSION: 5-SPEED AUTOMATIC (W5A5... CONNECTIVITY GROUP READ MORE! 4x4, CD Player, Aluminum Wheels, Brake Actuated Limited Slip Differential Child Safety Locks, Steering Wheel Controls, Rollover Protection System, Electronic Stability Control, Bucket Seats. QUICK ORDER PACKAGE 24S SPORT S Engine: 3.6L V6 24V VVT, Transmission: 5-Speed Automatic (W5A580), Deep Tint Sunscreen Windows, Leather Wrapped Steering Wheel, Front 1-Touch Down Power Windows, Remote Keyless Entry, Power Heated Mirrors, Power Locks, Auto Dim Mirror w/Reading Lamp, Security Alarm, Chrome/Leather Wrapped Shift Knob, TRANSMISSION: 5-SPEED AUTOMATIC (W5A580) Hill Descent Control, Tip Start, BLACK 3-PIECE HARD TOP Rear Window Defroster, Freedom Panel Storage Bag, Rear Window Wiper/Washer, CONNECTIVITY GROUP Uconnect Voice Command w/Bluetooth, Vehicle Information Center, Tire Pressure Monitoring Display, RADIO: 430 Remote USB Port, ANTI-SPIN DIFFERENTIAL REAR AXLE, SIRIUS SATELLITE RADIO, For More Info Call 888-539-7474, ENGINE: 3.6L V6 24V VVT (STD). Edmunds.com's review says "It's more capable than any other SUV, and its relatively low price is hard to beat. ".